This detailed volume aims to introduce nanomaterials as a new therapeutic regimen in treating human diseases. Divided into four sections, it explores inorganic nanomaterials, organic nanomaterials, pharmaceutical properties of nanomaterials, and applications of nanomaterials in medicine. Several examples of inorganic and organic nanomaterials are provided to demonstrate how to design and develop nanomaterials for pharmacological purposes. 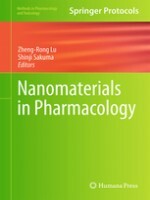 The key pharmaceutical properties, including biocompatibility, tissue interaction, pharmaceutics, and pharmacokinetics of nanomaterials are discussed with a focus on the safety and pharmaceutical considerations of nanomaterials in translational development.The pharmacological applications of nanomaterials are depicted in treating various human diseases, including cancer, cardiovascular diseases, immune disorders, infectious diseases, gastrointestinal disorders, bone diseases, respiratory disorders, and drug delivery. Written for the Methods in Pharmacology and Toxicology series, chapters include the kind of specifics and practical advice that ensures a smooth transition into the lab. Authoritative and enlightening, Nanomaterials in Pharmacology serves as an ideal guide to researchers investigating the potential benefits and risks of nanomaterials in pharmacology in order to avoid the pitfalls and to maximize the potential of this vital field of study.